Large scientific experiments and simulations produce vast quantities of data. 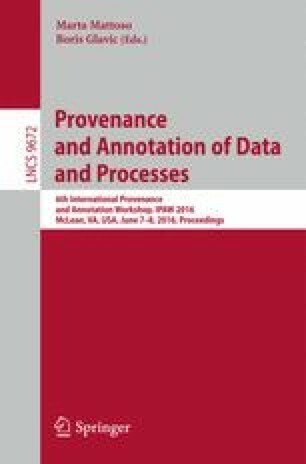 Though smaller in volume, the corresponding metadata describing the production, pedigree, and ontology, is just as important as the raw data to the scientific discovery process. Driven by the application needs of a number of large-scale distributed workflows, we develop a metadata capturing and analysis system called MPO (short for Metadata, Provenance, Ontology). It seamlessly integrates with most data analysis environments and requires a minimal amount of changes to users’ existing analysis programs. Users have the full control of how to instrument their programs to capture as much or as little information as they desire. Once captured in a database system, the workflows can be visualized and studied through a set of web-based tools. In large scientific collaborations where the workflows have been built up over decades, this ability to instrument the complex existing workflows and visualize the key interactions among the software components is tremendously useful. This work was supported by the US DOE, Office of Advanced Scientific Computing Research and the Office of Fusion Energy Sciences under DE-SC0008697, DEAC02-05CH11231, and DE-SC0008736. The rights of this work are transferred to the extent transferable according to title 17 § 105 U.S.C.